When did it begin? Is it a lifelong problem or a recent occurrence? Has anything changed in their environment, life style or diet? When does your pet lick and chew it's paws the most? You should also consider if it happens after being out in the yard, after your dog goes on a walk, after eating or if it is seasonal. Do your dogs' paws seem to be bothering him or when he walks is he favoring a paw? These questions will help you pinpoint the cause of the behavior and the underlining problem. Allergies- often a pet may have both food and environmental allergies but the symptoms only become noticeable during certain times of the year. The K9 Yeast Defense Package combined with Proaller and Notatum can give them great relief. The dog's paws often become wet and stained from the chewing which can lead to yeast overgrowth and a consistent "yeasty---cheese like" odor. The Proaller and Notatum are very helpful for reducing itching and chewing. To help with contact allergies, consider specialty dog socks to limit exposure when outside or soak their paws in the bathtub or sink upon your return from outdoor activities. For food allergies a special hypoallergenic diet may be required. Keep the following ingredients out of your pet’s diet: Corn, Soy, Chicken, and Peanut Butter. Bacterial And Fungal Paw Infections- Abnormal odor, pain, redness, swelling and limping are the most common signs of these infections. They may need to be treated with antibiotics or holistic supplements. Put an end to your dog’s licking and discomfort once and for all. Unlike some ailments, a yeast infection in dogs can be treated by changing their diet and using a yeast killing formula like K9 Yeast Defense with Power Probiotic. 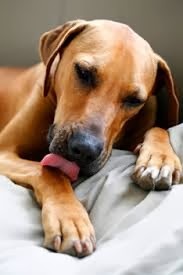 Injury or Arthritis- Your pet will lick an injured or painful area to try and heal it. If they are limping or appear stiff, check for an wound or tender area. If it is determine to be arthritis related our Arthritis & Joint Support Kit could help a great deal. Boredom or Psychological Causes-Self-grooming is the natural way that dogs pass the time , but it can also be an indicator of anxiety, stress or boredom. Consider if it happens when you are away from your pet or a change in the household...With a little lifestyle adjustment such as: more exercise, giving them distraction toys, or limiting their time alone your pet can stop the behavior.